We’d love your help. Let us know what’s wrong with this preview of Get Tough Stay Tough by Kenneth Radley. To ask other readers questions about Get Tough Stay Tough, please sign up. It is rare that a book imparts upon the reader a comprehensive overview of leadership, command, supervision and motivation in a way that remains interesting and engaging while being concurrently deeply educational and thought provoking. Radley has accomplished this and more in his work on the creation and development of the Canadian Corps during the First World War. It is important to outline at the outset what this book is not. It is not a discussion of Canadian operations, successes and failures during the War; nor is it an analysis in any way of Canadian operational doctrine. Finally, it is not a synopsis of the personalities of individual commanders that influenced the Canadian Corps, except in so far as they served as examples for Radley to use in order to highlight lessons that he wishes to empart. This book is an in depth study of the establishment and the maintenance of morale, discipline and leadership specifically at the platoon, company and battalion levels. It serves as a treatise on how the Canadian officers and NCO's conducted themselves in their relationships between each other and the soldiers. Radley draws upon well over three hundred sources in his analysis that serve to reinforce his central themes. 3. The disciplinary system of summary trials and courts martial must be both timely and balanced in order to be effective. A fully two thirds of the book is related to the above lessons. Lost in the maze of bureaucracy and regulation of the modern military are the fundamental tenants that we are soldiers first regardless of our occupation or trade; and that our primary duty, above all else, is to close with and destroy the enemy. Radley's book focusses upon those aspects of leadership that reinforce and highlight these ideals. As a counterpoint, he discusses the impact of a lack of leadership on discipline and on the effectiveness of units. Allowing standards to slip (such as saluting), turning a blind eye to insubordination and dress standards are guarantees of unit failure. Soldiers are not stupid and they will see what they and their peers can expect from their leaders and, if they can't trust them in training, they certainly will not trust them in combat; nor will they trust each other. Having said that, Radley discusses the subtlety of truly effective leadership and its ability to recognize when discipline may be indirectly applied. Once a unit has established trust between the officers, senior NCO's and the men, it is possible and expected that the realities of the incredible levels of stress and hardship that front line soldiers operated under would be recognized. Thus, as an example, officers inspecting sentries may well make noise as they arrive to ensure that the sentry is assured to be awake. This is not considered to be a abrogation of responsibility but an understanding of human psyche; used selectively, this approach can further strengthen the bond between officers and soldiers. Radley provides numerous examples of this more subtle approach; however, he also emphasizes that this application of leadership cannot be effectively taught but must be mentored and experienced in order to develop. The tools for reinforcing or re-establishing slipped discipline, that being summary trials and courts martial, are discussed at length by Radley. The methods of application of these must be both clearly understood and witnessed by the troops in order to ensure that the management of discipline is maintained. Timeliness and fairness are key underpinnings of the strength of the military justice system; failure to apply with a universal standard will undermine confidence in leadership, apply too liberally or too harshly will build resentment and delay too long and it will lose any message or meaning for the soldiers. The authors use of numerous examples and statistics reinforce this position and add emphasis to his argument. Radley closes his narrative in a unique yet unquestionably appropriate way: without input or analysis from the author he reproduces a order that Lt-Gen Guy Simonds issued almost 30 years to the day from the outset of WW1. It emphasizes clearly and succinctly the methods to be taken in order to maintain and build morale, enhance soldiers and officers relationships and trust as well as build professional competence. Radley's point is clear: the lessons have been learned and they have only to be remembered and applied. The author has also provided a comprehensive bibliography and extensive footnotes for the readers. Helion has published a book of the highest quality. The author is a previous professional officer in the Queen's Own Rifles of Canada and it is evident that he has researched and interpreted his topic from a position of in-depth knowledge and experience. It remains evident; however, that he has used that fact as a compliment to his research into the Canadian Corps and not as a baseline. His observations and discussions are thoughtful and insightful. Confidence in their leadership, comprehension of the mission and solid training are the pillars that Radley reinforces as representative of the backbone of Canadian Corps in the First World War. It was not easily achieved and required constant attention to maintain but it set the Canadians apart as a fighting force to be reckoned with regardless of the circumstances. Radley's book is both a testament and a reminder of those things that transformed Canada's volunteer force into an organization that was both heavily respected, emulated and feared. 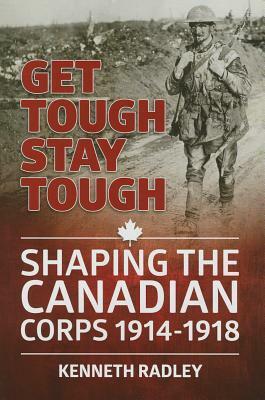 Overall, an excellent book, looking deeply into such things as crime and punishment, discipline, officer-OR relationships, morale and so forth , all in the context of the Canadian Corps in World War One. Lavishly annotated anecdotes and a lavish bibliography make this a delight for the source-chasing historian. I would have rated this higher if it were not for two things. First, the author has a tendency to belabor his theses somewhat, driving them home with a railway spike where a two-penny nai Overall, an excellent book, looking deeply into such things as crime and punishment, discipline, officer-OR relationships, morale and so forth , all in the context of the Canadian Corps in World War One. Lavishly annotated anecdotes and a lavish bibliography make this a delight for the source-chasing historian. I would have rated this higher if it were not for two things. First, the author has a tendency to belabor his theses somewhat, driving them home with a railway spike where a two-penny nail would have been more than enough. The other is his somewhat backhanded criticism of some current Canadian historians for making minor mistakes while making some himself. Additionally, he suffers the usual malaise of the soldier writing history in asserting that only the military man can truly understand the subject matter.